The Year of the Dragon is approaching, but for me it may be the Year of the Ram....wait for it...en. Ramen has never been my favorite manifestation of wheat flour noodles in soup, being characterized by (in my eyes) overly aggressive murky broths dominating overly delicate noodles; my own preference has been for more muscular la mian exerting its noodlehood in Lanzhou-style clear broths. But I'm succumbing to the siren call of ramen. For one thing, a ramen joint is a place for slurping noodles in solitary contemplation, and that's the way I roll. In this time of economic restructuring and changing dining habits the ramen-ya is also a coming thing, I'm guessing, with more regional styles and ramen skills on the way; I'm getting with the plan, man. My quest for my first bowl of noodles outside home in the new calendar year took me to Kirimachi. 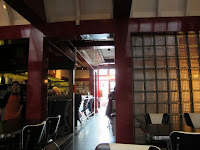 It's a new establishment, barely a month old, in a space shared with a chef producing Creole food. This is an arrangement you might expect in the hipster Mission, except Kirimachi is in the midst of Broadway's stripper row. In its brief existrence Kirimachi has generated a lot of positive buzz among ramen True Believers. It also has the attraction of being the closest ramen shop to my home. Leonardi, the ramen chef (he's Indonesian but a ramen obsessive who formerly worked for Sanraku) offers just two styles of ramen, tonkotsu and Sapporo-style miso ramen. He also offers one non-noodle dish, currently unagi donburi, but subject to change. 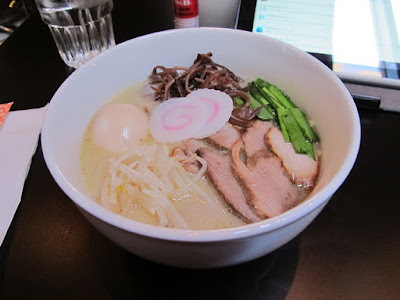 The noodles are $10 per bowl, tax included, and topped with a generous amount of chashu, chives, kikurage, sliced fish cake, bean sprouts and a soft boiled egg. Organic meats from Marin Sun Farms are used. Extra toppings are $1 ($2 for extra chashu). I ordered the Sapporo ramen out of curiosity, having some prior familiarity with tonkotsu broth. The miso broth (made with chicken stock) was rich and salty, but not so overbearing as to overwhelm the noodles, a subtleness that I appreciated. The noodles themselves were cooked perfectly, al dente without being overly chewy. The soft-boiled egg was also cooked just right, with firmly set white and a nicely runny yolk. Overall, it was definitely one of the best bowls of ramen I have experienced, and I'll certainly be returning. And oh, yes, John Lennon's "Power to the People" was playing as I ate my ramen. Right on, Leo! Where slurped: Kirimachi, 450 Broadway, North Beach, SF.